Most of us work tirelessly to pay the bills, right? Some harder than others, but to really feel engaged in our work, it is crucial to recognize the IMPACT our work has. Seeing positive, effective, and worthwhile outcomes and results from your work. According to the book, ENGAGEMENT MAGIC®: Five Keys to Unlock the Power of Employee Engagement, Impact is one of the five essential keys that make up the acronym, ENGAGEMENT MAGIC® (Meaning, Autonomy, Growth, Impact, Connection). Read how 15 employees see MEANING in their jobs. Read how these employees think AUTONOMY is crucial for employee engagement. Read how these companies promote GROWTH opportunities to their employees. Read how these employees find CONNECTION in their jobs. If meaning is the purpose––the “why” of our work, impact is the result––the “what.” Individuals can typically find meaning in their jobs, yet still feel like they are making little difference or progress. The missing piece is impact or being able to see a result from their efforts. 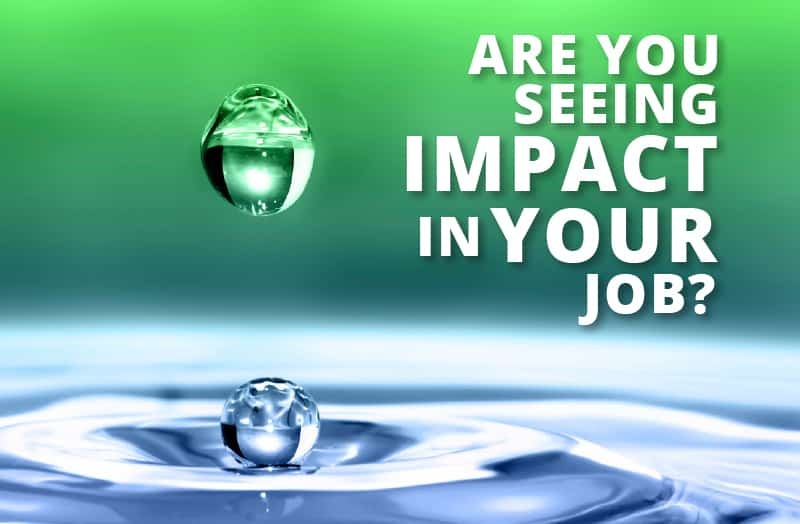 The book, ENGAGEMENT MAGIC®, also states that organizations that “close the distance” between work and impact will have higher levels of employee engagement. These organizations break down the barriers between the work environment and the end results of work so employees can see that their effort is producing something worthwhile. Engaged organizations find ways to make the work real. They remind employees, “This is why you’re coming to work every day. This is the difference you make.” How is this done? For instance, a medical-device company could have their designers post videos interviews with patients on the internet allowing all employees to see how their efforts impact real patients. Factories might reward employees who make the greatest contributions to increased energy efficiency. Schools could solicit testimonials from former students who get into prestigious universities and put them in the hands of teachers. Feedback is another powerful tool for creating impact and employee engagement. It may also be the easiest and quickest way to boost engagement. Some managers hesitate because they think if you give someone credit or positive feedback, they’ll become complacent. Research actually says that the opposite is true. People are more likely to become complacent because supervisors aren’t providing enough constructive feedback. I work for WikiJob, a forum, jobs board and careers advice center for students and graduates looking to enter the world of work. I was hired almost three years ago, and was the first marketing employee at the firm. My responsibility was to grow our audience and grow our affiliate marketing revenue. As such, I redesigned much of our website, put a content marketing plan in place, and created more direct partnerships with our affiliate partners. Three years on, our annual traffic has grown from 3 million unique visitors to 6.5 million, and our affiliate revenue has grown by over 200%. This has transformed the business, made it much more profitable, and led to better employee retention (as well as more employees). I run a branding agency that specializes in mission and vision statements. Each time I work with a company or person to help them articulate their personal beliefs, drives, and purpose, I get a front-row seat to the positive outcomes of a person or company coming alive. One specific example coming to mind is a nonprofit foundation on the West Coast. I spent several hours on the phone, sending e-mails, and writing, as I attempted to put the spirit of the foundation into words. Every step of the process was exciting and powerful. I learned about the immense good these people were trying to achieve and I helped employees ignite their own passions. Once the project was complete, staff were excited to use the script, not because it was especially good for advertising, but because the script put words to why they did what they did. The script gave them the voice they were looking for so that they could share their excitement and passion with the world. As a retired educator and university administrator in the Atlanta area, the impact of my job was in the students with whom I interacted. One such student was Gordon. 22 years old, sporting a ‘do’ rag, pants hanging off his slim hips––he was an angry young man. He was my graduate work study student. He was very smart–he figured out how much my new car payment would be based on my trade-in, etc. all in his head, without the use of a calculator. But with the chip on his shoulder, and his mad-at-the-world attitude, I was frightened he would end up in prison–something I was determined wouldn’t happen. We disagreed at times and butted heads a lot. I mostly listened while he did a lot of the talking and processing. Today, Gordon is a public health analyst, husband, and proud father of three. My job’s impact was in the many student workers I supervised, mentored, and nurtured who are all successful, productive individuals. At Mentat, I get to connect people directly with hiring managers for positions. No need to fill out endless applications on job boards with no responses. A positive impact that I see at my job is helping people find a job. The rewarding feeling that comes with helping a frustrated or desperate individual secure employment is indescribable. The current methods of finding a job are outdated and basically set people up for failure. Applications get thrown out by applicant tracking systems if they are formatted incorrectly. Thus, some stellar applicants never come across the desk of hiring managers. People apply to hundreds of positions and only hear back from a small handful. It’s awful, especially for someone who has been unemployed for a while and really needs to find a job. Whenever I feel like I’m hitting a wall at work, I look at our testimonials and all the nice things that people have said about our service, and it reminds me that we’ve done a lot of good for people who need a job. As a team, we all celebrate each placed client as a victory. Everyone whose story I listen to keeps me motivated to keep going and keep reaching out to people who need help. Words like these remind me of the impact I have on other people’s lives. At One Last Frog we plan events for a multitude of clients. Specifically, our organization gives back by using 10% of our revenue to plan parties for children who are less fortunate, those who have never celebrated a birthday, or children with disabilities. We have also expanded these endeavors to planning weddings for couples with immense financial distress who have never had the opportunity to have a wedding. A specific example is a Sweet Sixteen party that we planned for a little girl named Jaya. She has special needs, and we went above and beyond to make her event amazing. We had a memorial table set up for her beloved deceased mother and we made a children’s buffet full of gluten free foods for her and her friends from her school and dance class. We designed a mocktail bar so the children could feel a little more grown up, and we made sure that all vendors were aware of the children’s developmental conditions so we could give premier service tailored to their needs. The impact endeavors like these have on our employees is astonishing. Our employees work harder and want to go the extra mile because they get to see and feel the impact of their efforts. When you see that little girl with her friends and family enjoying the night and celebrating her life, it is beyond explanation. Our employee engagement and work ethic definitely increase after events where we really create an impact on other’s lives. For example, they move quicker by refilling the water in the vases, making sure everyone in wheelchairs can get down the ramp, and they are more optimistic with how they approach a new or challenging client. As a business owner, I evaluate employee engagement after each event. I gauge our culture, and see engagement increase after each event as our employees witness the difference they make in other’s lives, as we did for Jaya’s Sweet Sixteen. As a board certified educational therapist and certified school principal, I’m the founder of Brightmont Academy, an accredited private school for students in grades 6-12 that uses an innovative one-to-one instruction model, pairing one teacher with one student. This gives us the ability to customize all educational programs, and to accommodate a wide variety of student needs. I get to see positive impact firsthand every single time I attend a graduation and shake the hand of a young person who has earned a high school diploma from Brightmont Academy. Because we offer one-to-one instruction, we serve a wide range of students, including those with physical and mental health issues, learning disabilities, highly capable cognitive skills, and extraordinary talents that pull students out of school for competitive tournaments or performance opportunities. One recent graduate signed with a professional sports team during his senior year, and needed to begin touring with them in March, well before the end of the traditional school year. We were able to accelerate his studies so that he completed all coursework and earned his diploma just one day before starting the tour. Brightmont graduation ceremonies are as diverse as our students, and his consisted of a series of texts and us overnight-shipping his diploma to his father, but it was still quite an exciting celebration. Our student was able to earn his diploma and begin a promising athletic career without having to give up or postpone either dream; getting to facilitate that kind of achievement makes my job the most rewarding there is. GiveMeTap is a social enterprise that sells BPA-free water bottles. For each bottle sold, we give 5 years of clean water to a person in Africa. As a Growth Marketer, my job is to engage in marketing activities to expand our market presence. My day is really unpredictable. In any given day, you may find me writing a blog post, pitching to an influencer on social media, analyzing our website performance, or looking for events for sponsorships. Since I work for a social startup, every single thing I do matters. Every person that I talk to, every piece of content I write, every event I attend…. everything counts. Because of my efforts, more people are hearing about GiveMeTap, buying more bottles, and that results in more people in Africa getting access to clean water. So, when I’m overwhelmed or disengaged, that’s what I remember––what I do changes lives. Every minute that I waste on Instagram is a minute that I could have spent introducing GiveMeTap to someone who would change a life forever. And that renews my strength and engagement!